HAD THE CORPORATE MEDIA NOT BETRAYED THEM! Mouths are agape and praises are flowing. Applause and accolades are heard everywhere. Imagine! Just imagine! For the first time in five years, a handful of reporters and television pundits actually told the truth. For the first time in five years, the evidence was so clear and the consequences so shocking, that a few corporate news people who were witness to the horror that followed Katrina, actually found their own voices. For the first time in five years, the Bush administration was publicly accused of being inept and dangerous and deceptive. Finally, some reporters who could no longer deny the obvious simply refused to play the White House game. For a brief moment in time, American television viewers heard the hard questions and learned the damaging truth about a painful and devastating disaster from the corporate sycophants themselves. And guess what? In the wake of this terrible tragedy, the likes of Tim Russert, Shepard Smith, Geraldo Rivera, Jack Cafferty Anderson Cooper and yes, even Paula Zahn, were transformed into instant heroes. Why, because they were actually honest with the public? Why, because they refused to toe the corporate line and give George Bush another uncontested pass? Why, because on this one occasion they did what they should have been doing for the past five years? Exactly. Only it’s too little, too late. Thousands are dead in Louisiana because no one asked questions when they should have been asked. All of the hoopla is taking place after the fact. And therein lies the greater horror. In the past few years, so many lives might have been saved, not only in New Orleans – but in so many parts of the world, had the media only raised the questions they was morally obligated to ask. The dead are dead, and they had no one in the corporate media to champion them. The silence of the news networks has been shamefully deafening and will remain predictably so for a long time. But for a moment, imagine the numbers of people who might have lived had the corporate media not betrayed them. Imagine what might have been had George Bush and his band of thugs been confronted at every turn by the hard questions that should have been asked by honorable journalists? Just imagine what might have been if this administration had been held accountable for its lies and deceptions by the news networks and the press corps. Imagine how many thousands of people might still be alive. Imagine how many maimed bodies might still be whole. Imagine how much suffering might have been avoided. Just imagine. There is so much, it can’t all be told here. There’s no time to retrace the way it all got started during the disgraceful election of 2000. But we can start with the attacks that horrified the nation and the world on 9/11. What if the right questions had been asked back then? What if fear and intimidation had not paralyzed the mainstream media? What if they had acted as watchdogs instead of our lapdogs? What if the media had demanded the truth instead of becoming complicit in the lies? What if? What if? What if people in the corporate media back then had exhibited the kind of backbone we saw coming out of New Orleans? What if these ersatz journalists had mustered the real courage that was needed to investigate the discrepancies and the distortions about 9/11 and its aftermath that were coming out of the White House? What if they had challenged the dangerous lies of the warmongers who used 9/11 as a tool to catapult us into Iraq? What if? What if someone, somewhere in some news network had refused to swallow the distortions then as they did now? What if even one reporter had demanded that the President, his handlers, or his hired guns answer the questions that the American people had the right to know? What if someone, somewhere in some news network had bothered to investigate and reveal even a minimal amount of truth to the American people? What if? What if there had never been a war against Iraq because the truth had been exposed? What if a single corporate news network had challenged the lies about WMD’s and the Iraq - Al Qaeda connection? What if someone had revealed the PNAC pre-9/11 war plans and had exposed PNAC members in high positions in the Bush administration? What if even one corporate news network had refused be a cheerleader for “Operation Iraqi Freedom?” What if even one corporate journalist had publicly questioned the legality of an unprovoked invasion of a sovereign nation? And what if only one honest investigative reporter had stood up and denounced the “shock and awe” bombing of a vibrant, populated city of innocents? What if? What if the lies had been reported and as a result, carte blanche war powers had not been given to George Bush? What if there had been no war? What if there had been no beheadings, no road side bombs, - no insurgency and no increase in terrorism? What if there had been no horrific torture of prisoners in Iraq and Afghanistan and Guantanamo? And what if Halliburton and the Carlyle group had not profited so handsomely from the destruction their friends in Washington had designed. What if? What if tens of thousands of Iraqi civilians were still alive? And what if thousands more had healthy, unscarred bodies? And what if more than 2000 American and coalition troops were still alive? And what if thousands in the military were whole again in body and in mind? What if? Really, what if? WHO WILL SHAME THE DEVIL? Don’t get your hopes up. It won’t be the corporate media. Even as this is being written, the blame is already shifting in aftermath of Katrina. The Bush administration is throwing the onus of ineptitude onto the local authorities in Louisiana and many in the corporate media are going along with the ruse. At this very moment some reporters have taken to drawn military press releases rather than filing firsthand reports. As this is being written, for all intents and purposes there is no war in Iraq, and as this is being written, no one is dying because of the lies and deceptions that the media refuse to challenge. The complicity continues as before despite the momentary variance we saw this week. Not a single corporate news network reported that August was the deadliest month for American troops this year. Not a single news network tallies military deaths or reports the number of Iraqis who die each day because of this insane war. Not one has mentioned the deadly raids on civilians in Talafar. Not one. So, who will shame the devil? Don’t get your hopes up. The momentary outcry in New Orleans was an anomaly, not a trend. It was an emotional response to unimaginable suffering that could not be denied by those who saw it up close. That’s all it was. Understand that there were clear warnings about the vulnerability of the levees. Scientists and engineers informed the administration that New Orleans was a disaster waiting to happen. The media never reported on the Bush administration’s numberous manipulations and or suppression of scientific data in reports ranging from environmental toxins to global warming! But the media loyally promoted Bush’s tax cuts for the wealthy at the same time that funds for strengthening levees were drastically reduced. What if someone in the White House had been asked to justify the insanity of such an action? The media never asked the questions and so many people died. What if they had asked the question? Dammit, what if? What if questions had been asked? What if something had been done? What if one reporter had investigated the background of a failed horse show director who became the head FEMA? What if someone in Washington had to explain that appointment? The media never asked the question. What if they had, - might some people be alive today? What if? And of course, there were very clear warnings that the war in Iraq was a hoax perpetrated by PNAC and our oilmen In the WH for their own purposes. No matter, UN inspectors and their pleas for more time were mocked by the media. Former generals, statesmen and historians who warned against the folly of an invasion were ignored. Even as it became clear that no threat from Saddam Hussein existed, the media joined the march to war with a vengeance. They became shills for PNAC and whores for ratings. What if they had retained an iota of decency? What if? Had the corporate media shamed the devil from day one, so many people might be alive today. The war against Iraq, like flooding of New Orleans, need never have happened. So much suffering, so much death and so much destruction might have been avoided if questions had been asked in time and if truthful answers had been demanded. But they were not asked, and even the simplest truth has yet to emerge. The task then, is up to us. We, alone, must try to shame the devil. At this very moment, because there has been a crack in the wall of silence, we have an opening to do just that. For the first time ever, there was outrage, there was horror, and there was rebellion in the ranks of the corporate media. Surely it was impulsive and unplanned, but it was real. We can take advantage of this momentary glitch in their armor and storm the media Bastille in its moment of weakness. The time is September 24th, 2005. The place is Washington, DC. The goal is to show the nation and the world that we will no longer allow this administration, with the complicity of the media, to continue on its path of failure and destruction. The corporate news media will be in attendance, and we can challenge them wherever we see them. Ask THEM the questions they should have asked. Record their answers, or their evasions. Film the media as they film the protesters. Challenge their silence. Challenge their betrayal. Carry signs that expose the media for the culprits they are. Accuse them of their betrayal and demand that they start asking the questions they have avoided for all this time. LET THEM KNOW YOU KNOW WHAT THEY ARE and LET THE NATION AND THE WORLD KNOW WHAT THEY HAVE DONE! We can do it. We really can. And watch for us at the rally. 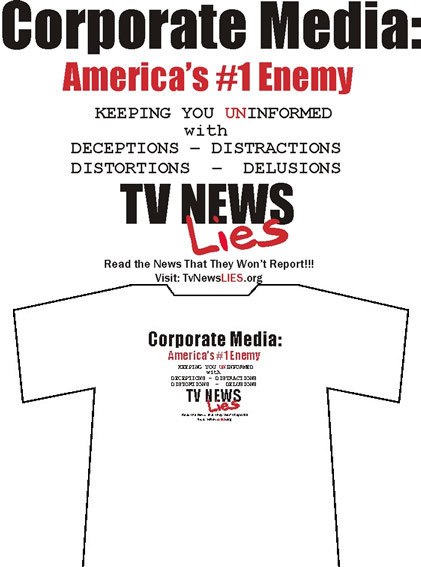 Come over and say ‘hello.’ We’ll be wearing T-shirt that let the world know that the Corporate Media is America’s #1 Enemy! You can be sure that TvNewsLIES will continue to fight corporate media deception whenever we see it. But just imagine what might happen if all of us worked together to win that fight. What if more and more news people were to break ranks and join the truth seekers? What if more news people began to ask the questions that must be answered? What if they refused to go along with the talking points and began to tell the truth? What if that actually happened? What if? Just imagine….what if? EDITOR’S NOTE: The corporate media have spent the past 5 years telling you to be scared. They have distracted you with the PNAC/Miltary Industrial Complex fairy that a group of cave dwellers are a greater threat to you than cancer, global warming, environmental toxins and of course hurricanes. They have mesmerized you with the fairy tale that is the official conspiracy theory of 9/11. They have distracted you with celebrity trials, personal tragedy such as husbands murdering wives and runaway brides; stories that would be vanquished to the covers of supermarket tabloids in days past when real journalists were dominating the broadcast news. They have left you in the dark about the immoral greed involved in every single bill passed by Congress. The corporate media have blood on their hands. Had they done their job we would know what our leaders have been up to and perhaps we could have stopped the criminals who now own our nation’s government and use it for the greedy personal purposes. One burst of humanity does not absolve the media of their complicity in the crimes of the corporate government of the Unites States. America, Be Not Proud - FROM THE EDITOR’S BLOG - We will no doubt see a lot of political congratulations, praise and tributes to the many people who will take part in the effort to normalize the lives of the people displaced by Katrina and many of us will feel a newborn pride in our nation because of this. Don’t be fooled, we have a long way to go before America should be proud. While CEOs of corporations in America earn more that 400 times the salary of their average employee, people in this nation go hungry.